This headline of last Friday's Washington Post story caught my eye. RBG is a hero of mine. Not only do I admire her physical workouts, especially her push-ups, but I am grateful for her ever-watchful eye and lifetime of steadfast actions she's taken to protect and promote women's rights. To absorb RBG's legal reasoning about why the United States needs both the ERA and the 14th Amendment to protect sexual equality, read her cogent argument in the January 1979 Washington University Law Review – Symposium: The Quest for Equality. When the ERA deadline for ratification was reached in 1982, I was in my early 30s, living in heady times when women were on the march and I could see women's lives changing around me. In my federal court case, Ludtke v. Kuhn, Judge Constance Baker Motley's ruling moved a mountain of resistance to secure equality for women sportswriters – and though there weren't many of us, the ruling's symbolic import was huge. Perhaps because I existed in my euphoric bubble I trusted that progress towards gender equality was inevitable and unstoppable; it would be only a matter of time before the ERA would be in our Constitution. After all, who could object to works with legal standing that achieve what is fair, just and right? It was suffragist Alice Paul who in 1923, on the 75th anniversary of the 1848 Women's Rights Convention, had introduced the "Lucretia Mott Amendment. It read: "Men and woman shall have equal rights throughout the United States and every place subject to its jurisdiction." This was introduced in every session of Congress until a slightly reworded ERA amendment passed in 1972 and was sent to the states for ratification. When favorable state votes stalled as the seven year window was about to end, Congress extended the deadline by three years. Alice Paul died in 1977, which was the year when Indiana became the 35th and last state to ratify the ERA before the deadline came. In 1980 the Republican Party dropped the ERA from its party platform. In 1923, Alice Paul, rallied support for the cause of equal rights, by observing that "if we keep on this way they will be celebrating the 150th anniversary of the 1848 Convention without being much further advanced in equal rights than we are. . . . We shall not be safe until the principle of equal rights is written into the framework of our government." Alice Paul was right. By 1998, the ERA was dormant. Only recently, and with good reason as women experience setbacks in the successful struggles we've waged and won, is there talk of reviving the ERA. And action, too: On March 22, 2017, the 45th anniversary of the day that Congress sent the ERA to the states, legislators made Nevada the 36th (of 38 needed) to ratify the ERA. There's debate, of course, about their timing given that the Congressional deadline of 1982 long ago ended. So if that's the fight we need to have in Congress, I'm with RBG. I say let's do it. 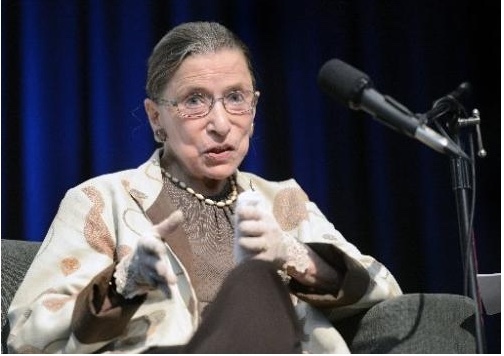 Excellent interview with RBG in The Atlantic, published after I wrote this post.